Don't be fooled by competitors labeling their duct tape as "100 MPH Duct Tape", when it's just ordinary industrial tape. Our 100 MPH HD TAPE® is a Mil-Spec heavy-duty, superior waterproof quality duct tape in the approved Field Green shade. It earned the name "100 MPH HD DUCT TAPE" when it was used for aviation repairs in combat operations. Meets ASTM D5486M-06 Type IV (replaced PPP-T-60E Type IV Class I - canceled 1995) that all Military Supply Officers know. Known for high-speed repairs of nearly anything imaginable - clothing, aircraft skins, cracked hulls, you name it! Universal usage because it sticks to almost everything. Makes a great waterproof closure on cardboard cartons. Ours is the very best industrial grade that is far superior to hardware store silver duct tapes, and even better than our 90MPH Duct Tape. 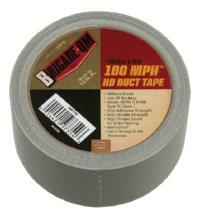 Keep a roll of Brigade's 100 MPH HD TAPE® at home, in your vehicle and in your deployment gear. The 9 meter roll is conveniently sized for in the field use.